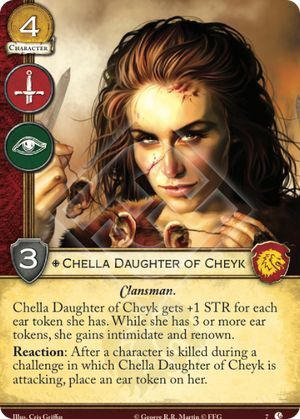 Chella Daughter of Cheyk gets +1 STR for each ear token she has. While she has 3 or more ear tokens, she gains intimidate and renown. Reaction: After a character is killed during a challenge in which Chella Daughter of Cheyk is attacking, place an ear token on her. Lions of Casterly Rock #7. What’s great about Chella is that she can fit in any deck—not just the clans. Gaining +1 power for each character killed in her challenges, throw in a PTTS and she finds an easy way to get her renown and intimidate. Unfortunately, to really get her going does take some time and winning all the MIL challenges. Plus, she’s a great target for Ward! Ser Gregor Clegane's ability may result in Chella gaining intimidate and renown in the middle of processing keywords. The first player chooses the order in which different keywords are processed. So, if the first player is controlling Chella and Gregor, he should choose to process pillage first; otherwise, he should choose to process intimidate and renown first. The first player cannot choose to process keywords that are currently not present in play or not active.